The WorldVeg Team (white shirts) and a local farmer had a lot to smile about during the forum. Six World Vegetable Center representatives (3 staff and 3 farmers) working on the African RISING Project in Ghana participated in the event. 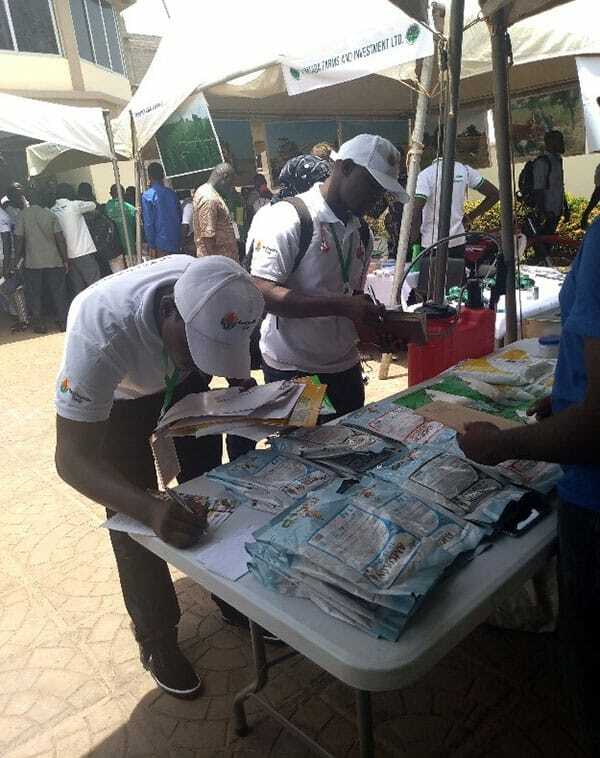 The forum provided an essential link for farmers to access quality improved seeds, fertilizers, machinery and other inputs. The diversity of stakeholders present at the forum offered the team a good platform for scaling WorldVeg validated technologies. In his opening remarks, NASTAG President Mr. Thomas Wilfred Havor emphasized that improving farmers’ access to quality inputs, particularly seed, can catalyze agricultural productivity, ensure food and nutrition security, and guarantee sustainable employment for youth. The CEO of the Northern Development Authority, Chairman of the National Seed Council, the Agriculture Team Leader from USAID Feed the Future, a Project Coordinator of SAPIP, and the Director of the MOFA Plant Protection Service Division gave brief statements. Dr. Sagri Bambage, Ghana’s Deputy Agriculture Minister, gave the keynote address and officially launched the exhibition and two publications by the National Seed Council: a 2019 seed directory and a seed production manual, “Principles and practices of seed production in Ghana.” Through the NDA, the government plans to set up about 30 mechanized seed structures in northern Ghana. Mrs. Gyina from USAID noted plans are being formulated to set up seed laboratories in the country. The WorldVeg team shared the Center’s vision and mission with stakeholders and potential partners such as RMG Ghana, Miqdadi Ltd., HTC Ghana and the International Potato Center (CIP), demonstrated key WorldVeg achievements and accomplishments within Ghana, specifically on the African RISING Sudano Sahel Project, and distributed promotional materials on validated technologies in use in Ghana’s Northern region. HTC Ghana develops solar-powered irrigation systems and is interested in collaborating with WorldVeg by using such systems in vegetable trials in Northern Ghana. Isaac Korku Dorgbetor, Sweetpotato Breeding and Seed Systems Manager for CIP, Ghana, would like to explore future partnerships with WorldVeg. CIP has its Ghana headquarters at the Savannah Agriculture Research Institute in Tamale and plans to create a platform there for further interactions. 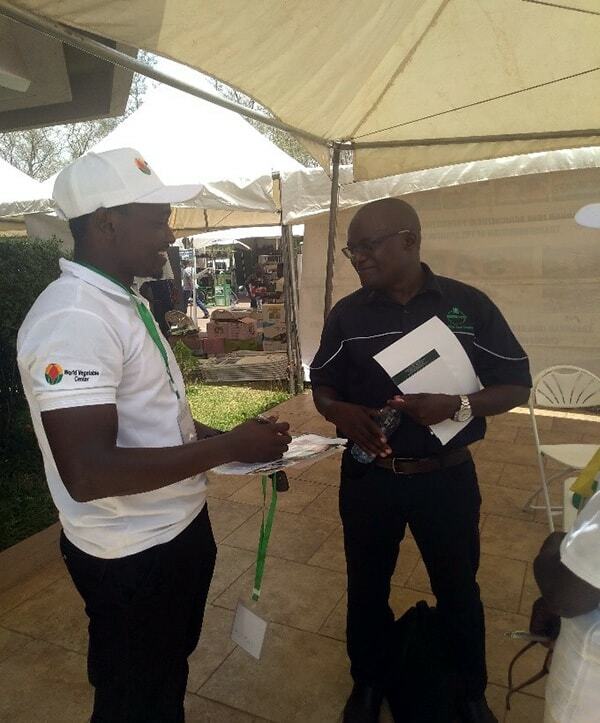 Miqdadi Ltd., a big agri-input dealer in Ghana, proposes to support WorldVeg with agri-inputs to conduct trials and demonstrations while showcasing their products and services. Farmers participating in the African RISING Project shared their successes, experiences and benefits from the project (varietal trials, Good Agricultural Practices, etc.) and stressed the need to adopt improved technologies to succeed. 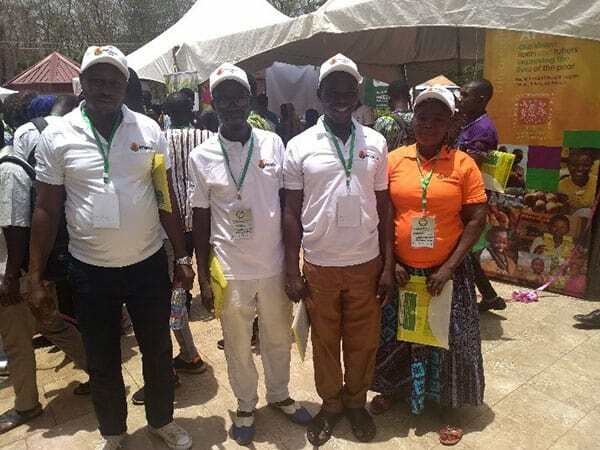 They also had the opportunity to connect with agri-input dealers and marketers seeking to buy vegetables. 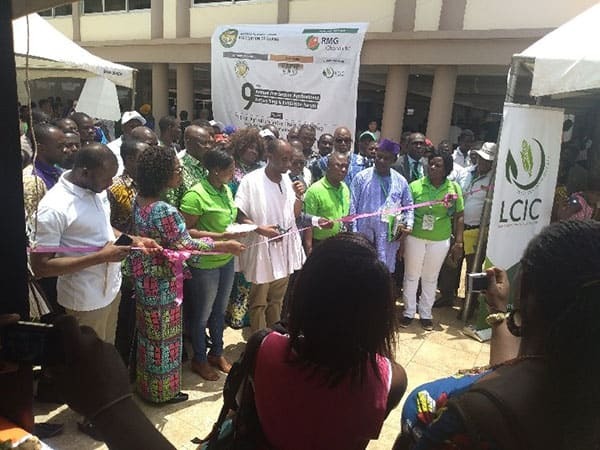 Dr. Sagri Bambage, Ghana’s Deputy Agriculture Minister, cut the ribbon to officially launch the exhibition. The WorldVeg team visited other stakeholders’ booths to learn more about their activities.